The demo is written in C++ and GLSL using OpenFrameworks 007 as a base. That’s a bit of a departure from my usual DirectX + custom engine approach, but I needed to familiarise myself with OF for my job and this seemed like a good way to go about doing that. So this is actually my first ever (and possibly only ever) OF release. The wonderful soundtrack for this demo was created by Brendan Ratliff, aka Syphus, aka Echolevel. This isn’t the first time we’ve worked together – back in 2008 we made the matter-of-factly named Ribbons, Tunnels & Techno, a demo that I’ve always had a bit of a soft spot for. Shortly I’ll be packaging up the code for a full source release and I’ll blog a bit more about the creation of the demo at the same time. Until then you can download the windows executable from the Ate Bit site and, if you’re feeling generous, you could always leave a nice comment on Pouet. 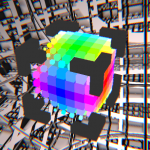 This entry was posted in atebit, Computers, Demoscene. Bookmark the permalink.